In recent weeks, media outlets across the world have marked the ten-year anniversary of a signal event in the global financial crisis: the bankruptcy and downfall of Lehman Brothers, once one of the United States’ most important investment banks. Much of the coverage has depicted the developments that led to the crisis, the villains of the piece, and the political heroics that pulled the world economy back from the brink, preventing a replay of the Great Depression. Yet the uncomfortable truth is that neither the structure of the financial system nor the political discourse around it has changed enough to prevent another such collapse. In many instances, the lessons of 2007-2008 have been forgotten – or else consigned to a distant, if gruesome, history that has little to do with the present. This complacency can be seen in President Donald Trump’s rollback of the tightened US banking regulations introduced after 2008. In May this year, Congress passed the first package of measures to significantly water down aspects of the 2010 Dodd-Frank Act. Moreover, Trump has appointed several officials who favour relatively lax regulations as the heads of key financial oversight agencies. As the Dodd-Frank Act provides these agencies with a great deal of discretion in enforcing financial rules, the appointments de facto weaken regulation. Similarly, few major governments have really taken to heart the threat from banks that are too big to fail. 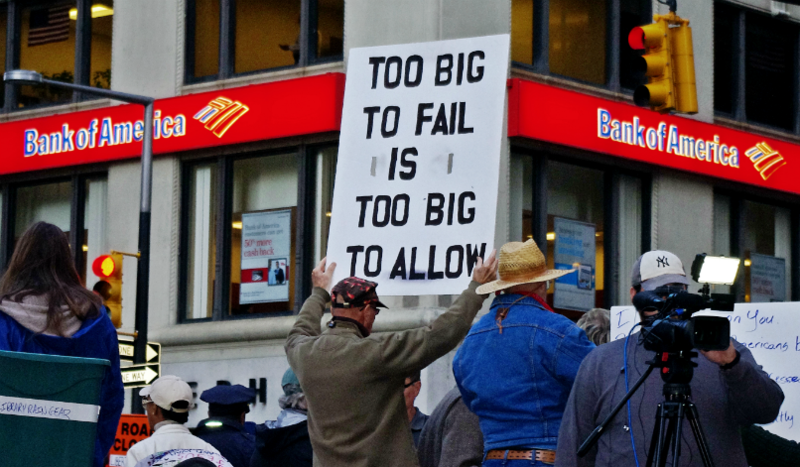 The crisis showed that it can be impossible to close down large, heavily indebted banks without harming the broader economy – a fact that forces political leaders to bail them out. This lesson seems to have been forgotten in many parts of Europe. For example, there is growing political support for a merger between Deutsche Bank and Commerzbank, even though combining their balance sheets – of around $1,500 billion and $500 billion respectively – would create an institution worth approximately 60 percent of German GDP. The balance sheet of BNP Paribas, France’s largest bank, grew from around $1,600 billion in 2007 to around $2,000 billion in 2017. Governments have also failed to address the challenges of financial complexity. One of the most striking features of the 2007-2008 crisis was that it revealed how few people understood the Byzantine interconnections between global financial institutions. After the Lehman insolvency and the subsequent market crash, there was widespread fear that the collapse of one major financial player would bring the whole system down – even if one could not perceive the exact linkages through which this would occur. Part of the concern came from the vast market for over-the-counter derivates (OTCs), non-standardised contracts between institutions that defaults or the movement of exchange or interest rates could trigger, and for which there was no central registry. In 2007, as the crisis began to unfold, there were $507 trillion in such derivatives outstanding globally (by comparison, projected global GDP for 2018 is slightly less than $90 trillion). In 2018, according to the latest data from the Bank for International Settlements, $531 trillion in OTCs are outstanding. Another problem is that the European banking union remains incomplete. European politicians have placed too little emphasis on addressing the well-known problems in the system that helped create and prolong the eurozone crisis. There still is no common deposit insurance scheme, while the common fund for recapitalising banks in a crisis remains laughably small. Thus, while the global banking system may not experience another crisis anytime soon, it is far from being so secure that one can rule out another worldwide financial meltdown in, say, the next decade or so. This would be worrying enough if we were only talking about potential economic damage: the collapse of 2007-2008 has cost hundreds of billions in direct expenditure to rescue banks and untold trillions more in lost output since. Yet, although most people do not realise it, the financial crisis has likely had an important role in the erosion of liberal Western democracy. Economists Manuel Funke, Moritz Schularick, and Christoph Trebesch have shown that, in advanced economies during a long period beginning in 1870, right-wing parties’ vote share increased by an average of 30 percent (not percentage points) following financial crises. This effect has been peculiar to financial crises and does not apply to recessions or macroeconomic shocks that come from outside the financial system. It is plausible that a financial crisis and subsequent bank bailouts create the widespread perception that a corrupt elite is exploiting ordinary citizens. Because the transfer of taxpayers’ money to indebted banks limits the government’s budget, fiscal austerity often follows a crisis. Austerity increases unemployment, as well as competition for increasingly scarce public goods such as healthcare, education, and infrastructure. In some countries, such competition can exacerbate hostility between native- and foreign-born citizens. The views of many European voters reflect this interpretation of events. For example, in the run-up to the Brexit referendum, some UK citizens expressed concern that migrant workers from central and eastern Europe had equal access to state schools and a National Health Service under strain from funding cuts. Similar worries prevail in districts of Berlin where there is strong support for the right-wing Alternative für Deutschland. A common complaint is: "the government has been telling us for years that is no money to repair the school building. But for banks and refugees, there suddenly is money." While the three economists’ empirical work invites criticism on several fronts, their broader point seems to hold true. If parts of the Trump insurgency and the Brexit vote can be counted as populist, it is difficult to find a country that experienced a severe banking crisis in 2007-2009 but has not seen a surge in the populist vote share. This phenomenon extends beyond right-wing parties: leftist populists such as Podemos have filled the vacuum in Spain, while the Italian political system has come under pressure from both fringes. Of course, there is more to the populist surge than the global financial crisis. But the events of 2007-2008 appear to have made a substantive contribution to the continuing political instability in Western democracies. All this points to a troubling question: given that populists already have a significant foothold in most Western states, where would another financial crisis propel them to? Ten years after the Lehman insolvency, it is high time that politicians treated finance as more than a technical economic issue; limiting the excesses of the financial sector could prove central to the survival of liberal democracies.